This is Lilly-chan here to say that Family of Moonlight is working getting is past articles back up. Since we moved servers some of our items didn’t merge over. So be on the look out for our past reports coming back soon. Until then I have changed our cover image and added a new link back button. Our lovely mascot artist- Kuroitenshi has created a NEW and official mascot for Family of Moonlight and her name is Sailormoonlight! Sailormoonlight! 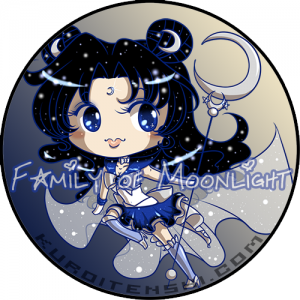 The official mascot for Family of Moonlight! Created and drawn by Kuroitenshi Art.New background, it’s Sailormoonlight’s symbol done as a full night sky. Art by Kuroitenshi Art. Shuto-con 2014– Convention Photos have been posted on our facebook page- https://www.facebook.com/media/set/?set=a.127992450556970.14870.120718584617690&type=3 I do have a couple videos from the Sailor Moon panel that will be added soon. I did not run a panel at Shuto-con 2014 this year, just was invited to sit on the panel as a guest panelist. Next Convention that myself & Kuroitenshi will be attending as Artist in the Comic Market Artist Alley with be Anime North 2014 in Toronto, Canada. So far there is 4 Related English Voice Actors- Katie Griffin- Rei/Sailor Mars, Linda Ballantyne- Usgai/Sailor Moon, Susan Roman- Makoto/Sailor Jupiter & Toby Proctor- Mamoru/Tuxedo Mask. Both myself and Kuroitenshi will be trying to get their autographs and pics with them. As for interviewing them I doubt it. We’ll just share pics of meeting them that’s all. That’s it for now. Please keep an eye on twitter & facbook for more updates.